‘What do a rugby team and website hosting company have in common?’ I hear you wondering. The short answer is that UKFast is the main sponsor of Sale Sharks, but for the full story of this relationship, we have to go back 18 years. 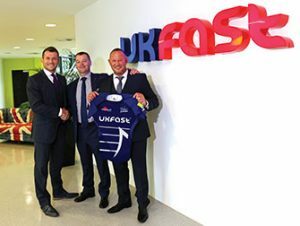 UKFast has a long history of supporting Sale Sharks as both sponsors and as Sale Sharks fans. Our sponsorship of the team goes back to 1999 – this was the same year that UKFast was founded and had just two employees, Lawrence and Gail Jones. Lawrence had predicted that rugby fans would one day use the internet to buy their tickets and to check club news, and since both were such fans of the Sharks but couldn’t yet provide financial support, they instead provided huge amounts of their time and technological investment which helped the club to fill its stadium. The rest is internet history, and a business relationship was made for good. Now, in some ways the Sale Sharks lads and Team UKFast do differ. For instance, here at UKFast Campus we try not to tackle each other to the ground during a work day, and cauliflower ear is far less common around the office. But in every other sense, the two businesses could not be more similar – whether it’s the technology in our data centers or the players on the field, we’re all committed to speed, power, determination, and resilience. Our sponsorship of the team is about more than a logo on a shirt too – with such a long history and a shared home in Greater Manchester, our sponsorship is about investing back into the community. The Sharks are a great community team and get involved with local schools, so we’re committed to giving back to the community in every way we can to make the partnership a perfect fit. UKFast look after match day experience, and the Sharks provide the on field excitement. When it comes down to the actual rugby, UKFast look after match day experience, and the Sharks provide the on-field excitement. With the 2017/2018 season underway, Team UKFast and our clients will be able to watch and cheer on Sale Sharks from the stands. When asked about the new season, Sale Sharks Flanker Magnus Lund said: “We’ve got UKFast on board again now this year – it brings back a few good memories for me. We’ve had some successful years with UKFast on board so obviously, it works well.”. You can grab a ticket for an upcoming game here. A limited number of free tickets are available for existing UKFast customers, please contact your account manager for details. Sign Up to the UKFast We Love MCR 10K 2017!